What does UKIP really stand for? Alaina Willis wonders why the public has such high hopes for a party which has yet to prove itself. Despite only making a name for itself relevantly recently, UKIP is not a party formed overnight out of mistrust and anger towards the three main contenders. It was founded over 20 years ago and, during this time, has focused on one core issue: EU immigration. Unlike the main three parties who are forced to have an array of policies, UKIP relies on this main topic. Through lack of scrutiny, it has become their bread and butter. Over the years they have slowly been rising to power and we have been foolish to not address this, as well as the concerns of the voters. 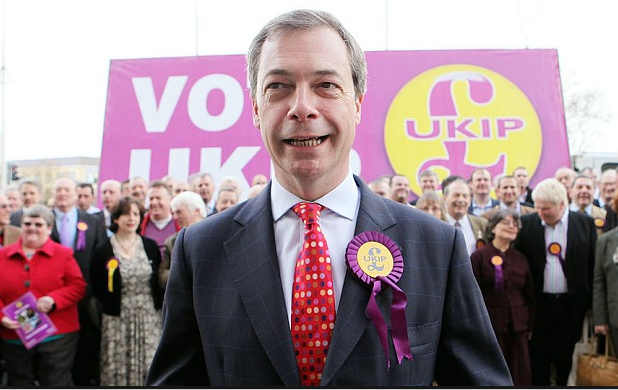 So, what does a UKIP manifesto look like? Transport: leave the EU and suddenly the tubes won’t be crowded. Health care: leave the EU and suddenly the NHS won’t have any issues. Nigel Farage has even been bold enough to claim during various Question Time appearances that the real way of fixing the housing crisis is not the proven method of capping rent but, much more conveniently, leaving the EU to stop immigration. Their own party website says nothing about the environment, the criminal justice system, or education, which are all fundamental issues in need of discussion. A serious party running for incumbency would never be able to bypass these issues completely. Although some argue their manifesto has taken this shape due to their short political life-span, the Green Party has continually managed to offer a variety of policies despite forming three years later than UKIP. Voters are feeling disenfranchised by the current mundanity of the three parties and, mainly out of frustration, voted for something they saw as different. Some even believe that UKIP’s single policy priority will fix most of our problems and this is, in part, due to the way politicians have continually brushed off UKIP as a non-threat. Some Labour MPs have even become reluctant to combat a party which is helping to defeat their main opposition. All the while, this attitude of anti-immigration is allowed to fester despite evidence that, since EU border laws loosened, immigrants have offered much more in taxes than they have received in benefits. However, we should be consoled by the fact that UKIP’s recent success was at a local level, which only offers the role of a Councillor. I am not discrediting the hard work Councillors do but, in local elections, immigration is not a fundamental problem nor can Councillors do much about it. Those newly elected UKIP members will add very little to the post due to their very narrow policy base. What their role entitles them to do vs. what they would like to do (shut and lock the door to Britain) does not equate. In reality, people will be disappointed with their actions, or lack thereof, by the time voters take to the ballot box in 2015. The public can be excused. They are picking UKIP due to a lack of alternative. For those in power, however, it is important that they learn we can no longer brush UKIP, or any other party, aside when it comes to immigration. Otherwise, we could be dealing with something much more sinister very soon.